Email or user ID substitution attack After signing in with Google on Android, some apps directly send email or user ID in plain text to their backend server as the identity credential. These server endpoints enable a malicious attacker to easily forge a request and gain access to any user’s account by guessing their email / user ID. We see a number of developers implement this anti-pattern by using getAccountName or getId from the Plus.API and sending it to their backend. Access token substitution attack After signing in with Google on Android, many apps send an access token obtained via GoogleAuthUtil.getToken to their backend server as the identity assertion. Access tokens are bearer tokens and backend servers cannot easily check if the token is issued to them. A malicious attacker can phish the user to sign-in on another application and use that different access token to forge a request to your backend. Many developers who have built the above anti-patterns into their apps simply call our tokenInfo (www.googleapis.com/oauth2/v3/tokeninfo) which is debug-only or unnecessarily call the G+ (www.googleapis.com/plus/v1/people/me) endpoint for user’s profile information. These apps should instead implement our recommended ID token flow explained in this blog post. Check out migration guide to move to a both secure and efficient pattern. If your server needs access to other Google services, e.g. Drive, you should use server auth code flow. You can also check out this blogpost. Worth mentioning, you can also get an ID token using server auth code flow, from which you can retrieve user id / email / name / profile url without additional network call. Check out the migration guide. 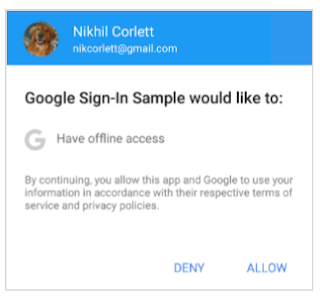 There are still many apps using GoogleAuthUtil for server auth and their users are losing out the improved user experience while the developers of those apps need to maintain a significantly more complicated implementation. The worst thing is the GET_ACCOUNTS permission. On Marshmallow and above, this permission is displayed to the user as ‘Contacts’. Many users are unwilling to grant access to this runtime permission. 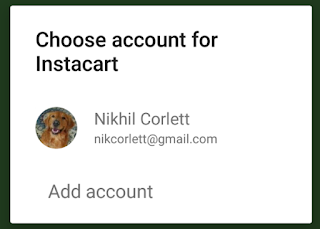 GoogleAuthUtil.getToken needs to take an email address, which usually leads to the undesirable user experience in Figure 3. Also, user’s profile information like name, profile picture url is valuable information to store in your server. The ID token obtained via Auth.GOOGLE_SIGN_IN_API will contain profile information and your server won’t need additional network calls to retrieve them. Solution Switch to the ID token flow using the new Auth.GOOGLE_SIGN_IN_API and get the one-tap experience. You can also check out this blogpost and the migration guide for more details. To easily avoid this “Have offline access” consent dialog, you should switch to server auth code flow using the newAuth.GOOGLE_SIGN_IN_API . We will issue you an auth code silently for a previously signed-in user. You can also check outthis blogpost and migration guide for more info. Should I ever use GoogleAuthUtil.getToken? In general, you should NOT use GoogleAuthUtil.getToken, unless you are making REST API call on Android client. UseAuth.GOOGLE_SIGN_IN_API instead. Whenever possible, use native Android API in Google Play services SDK. You can check out those APIs at Google APIs for Android.